There isn’t much to the making of a good tie – a slip stitch, good silk – but it’s surprising how few ties there are out there that I rate. Tiny things in cut, design and cloth make a big difference. One tie maker who contacted me recently not only joins that elite group, but jumps straight to the top. Passaggio Cravatte, a tiny operation based in Robbio (outside Milan) but using a workshop in Naples, is run by Gianni Cerutti and Martha Passaggio. Neither come from a tie-making background, but have a fantastic eye for design and quality. They only makes bespoke ties. You would have thought that if a tie is made bespoke, it would be perfect, but that’s rarely the case in my experience. I prefer the ones made for me by Passaggio Cravatte to others by Marinella, Rubinacci or E&G Cappelli. Most of the reasons are tiny. For example, Gianni’s preferred construction for a tie is the same as mine: a six-fold with a very lightweight lining, so the tie still has enough bulk in the knot but is very light in the tip. The bottleneck shape in his ties is just right as well, and that’s something that’s very hard to get right with bespoke. Many tie makers won’t alter the shape through the neck as it means creating a new pattern or drawing freehand. Those that have tried for me in the past have failed. A bigger advantage to Passaggio Cravatte, though, is their vintage fabrics. All available in small quantities, and often in unusual materials like printed gauzes or chalky dyes, browsing through them reminds me of the pleasure of searching the Rubinacci archive in Naples, or AntonioLiverano’s collection in Florence. Ninety per cent of the Passaggio silks are vintage, some 50 or 60 years old. For a price, they will make one-piece seven folds, though of course this depends on having enough silk available in the desired pattern. Also four folds in one piece, again unlined or lined as the customer chooses. The two examples below that Gianni made for me are a four-fold, lined red print and an unlined, seven-fold gauze. Only the red is vintage; both are made in the standard three pieces. I have my eye on a particular collection of Gianni’s vintage fabrics, and we may make these exclusively available to Permanent Style readers. It’s nice to do these kinds of projects on the blog, and I’m sure I can find some use for any silk left over. My only advice to readers would be, choose your construction wisely. As nice as the idea of an unlined, one-piece seven fold is, many silks are too lightweight to produce any kind of knot without a lining. Ask Gianni when you make an order. 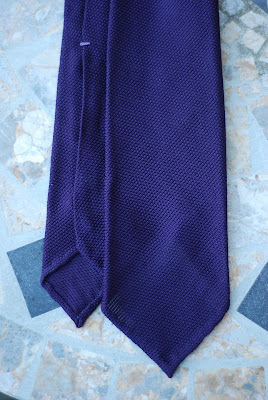 It is certainly worth having the tie untipped and the edges hand-rolled, however. The finishing there is beautiful. You can follow the discussion on Passaggio Cravatte ties by entering your email address in the box below. You will then receive an email every time a new comment is added. These will also contain a link to a page where you can stop the alerts, and remove all of your related data from the site. I do not see any point in a seven-fold unlined tie. That is like making a suit in nothing but worsted wool. The hair canvas is there for a reason as is the lining in a suit. Same with a tie. A soft wool canvas will give the tie a nice structure and volume resulting in a beautiful knot. The lining will effectively hide the inner construction. My T&A and Borrelli ties are all constructed like this and I am very happy with them. Hi Simon, great post and beautiful ties! One quick question: why do you prefer ties that are untipped? And does having such a light-weight tip affect longevity at all? Mr Crompton, regarding the bottle neck of the tie..how is the width of that part? Usually I have problems to find ties I like due to the fact the the upper part of the bottle neck is to slim, hence I find it hard to get a adequately sized knot with a large enough and satisfactory dimple. A very inspiring blog post! I think the unlined constuction is very appealing, giving the tip a somewhat softer approach. I made a far less luxurious, yet quite an exciting tweed experiment together with one of my readers in October last year. I would love to read more on your experiment, since the result seems to be quite modest, yet interesting. Is there any chance to get a translation? Dear Víťa, thank you for your kind words. Did the translation service help? Roughly, it was all about me wanting to wear bow ties with my everyday workwear. I wanted an understated, unlined woolen self tie diamond model, which was nowhere to be found. Inspired by unlined flannel ties with hand rolled tipping, I developed a diamond cut model together with one of my readers. As you say, the result was quite modest, just the way I wanted it 🙂 I believe few people can pull off wearing a bow tie, W. Churchill style. Less is more. Hi Simon, I heard that Passaggio cravatte now do RTW ties. Is this true? If so do you know any stockists ?